Tastes of The Valley Tickets Sold Out! Thank you to everyone supporting this event! Tastes of the Valley is a unique dining experience only available once a year as part of a major fundraiser for TLGV. This year Tastes of the Valley will be held 4 pm, Aug. 26 at the Publick House, Sturbridge, MA. All funds raised are used to support the mission of TLGV. The evening starts with a social hour featuring local wines, beers and beverages, as well as appetizers prepared by area chefs utilizing products farmed in the 35 towns of The Last Green Valley National Heritage Corridor. Guests will then be invited into the main dining room where they will be treated to an amazing multi-course, sit-down, farm-to-table dinner showcasing dishes created specifically for our event by some of the area’s top chefs. 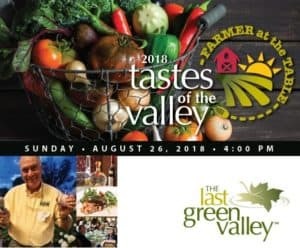 Seated at each table will be a special guest – either a local farmer, vintner, brewer or agriculture expert for you to converse with as you learn more about what it takes to keep The Last Green Valley green and delicious. The end of the evening features a dessert buffet and live auction featuring guest auctioneer Gene Michael Deary. Silent auctions and a raffle will be held throughout the evening highlighting locally-crafted items and experiences. It’s a different spin on the area’s best farm-to-table experience and the perfect way to support the efforts of The Last Green Valley. Dessert Buffet: Ben’s Beans, Renee’s Working Girl Catering, Sturbridge Coffee Roasters, The Farmer’s Cow.